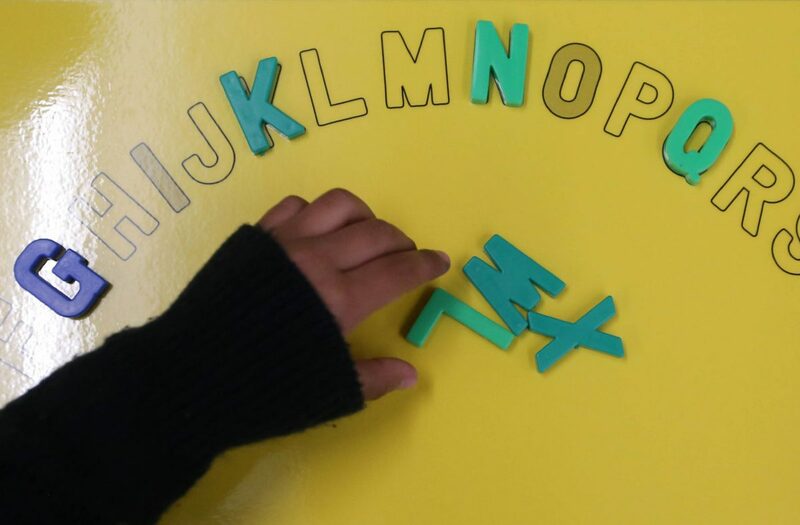 Anahy Pena, 5, arranges plastic letters while learning the alphabet in her pre-k class Tuesday, May 1, 2018, at De La Viña Elementary in Edinburg. 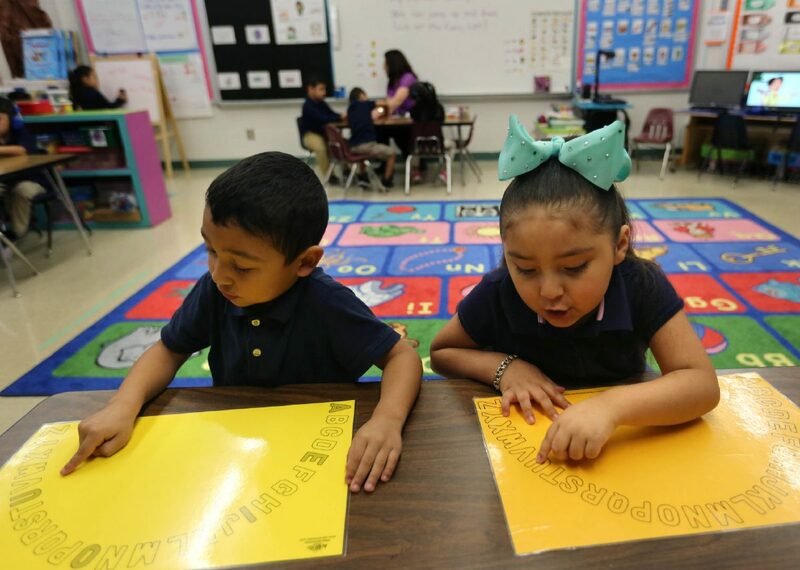 EDINBURG — Retention of students and an earlier introduction to the school district’s academic methods are the two main reasons why the Edinburg school district is moving to offer their half-day pre-K program to all students rather than only to those who qualify. The district is currently holding open enrollment for the next school year for all students regardless of the former qualifications, such as economic level and language skills. 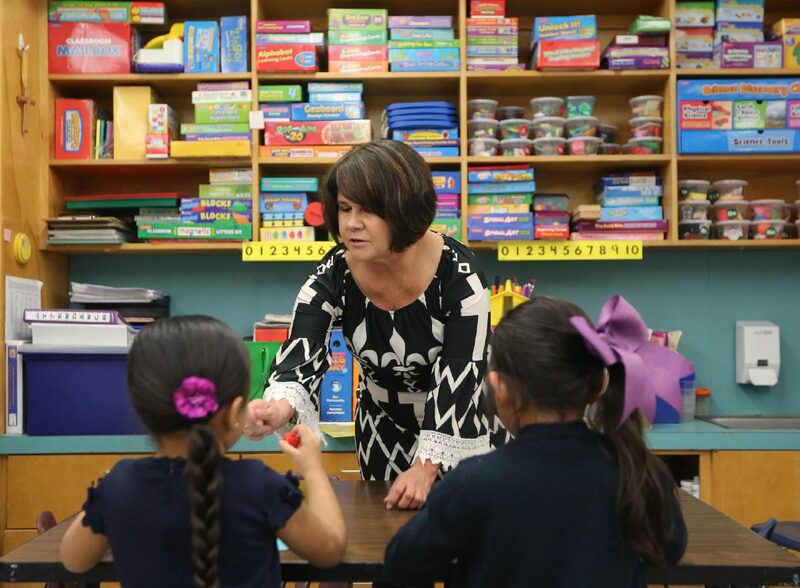 “The earlier the students start, the better they are going to be doing academically, and this is about starting them as early as possible,” Edinburg school district Superintendent René Gutiérrez said. While the district can’t yet afford to expand the pre-K program to a full day, mainly due to space constraints and cost, Gutiérrez said they hope the policy change will cover the need for more pre-K availability while they work on the overall goal of soon having a full-day program. Pre-k teacher Anilia Gonzaba helps students in her class Tuesday, May 1, 2018, at De La Viña Elementary in Edinburg. Joe Garza, 5, practices writing letters in his pre-k class Tuesday, May 1, 2018, at De La Viña Elementary in Edinburg. The district already had the classroom space and certified teachers available throughout the district, so no additional investment was necessary to transition to a universal pre-K program, he said. The district will consider allocating more funding to the program depending on the interest level of the community. For now, the goal is to keep classrooms at or below 22 students per teacher and teacher aide in order to comply with state requirements. Assessment of these numbers will come as the district starts enrolling students in the program. The curriculum taught in these classrooms is developed by district teachers and staff, she added. That, coupled with the fact that the students will attend the campus to which they are zoned, will help students have a more seamless transition into the district. The district has also partnered with the Hidalgo County Head Start Program since last year to place certified teachers in the Head Start locations zoned to the district. This is another effort to offer a similar pathway into the district and get students and parents familiarized with that the district has to offer. “Believe it or not, we already have recruitment even for 4-year-olds, and we have to, because otherwise somebody else is going to try to pick them up, and we want to make sure that our parents know that we have a lot to offer as a school district,” Gutiérrez said.